A new study from the Centers for Disease Control and Prevention finds no link between the number of vaccinations a young child receives and the risk of developing autism spectrum disorders. This is MORNING EDITION, from NPR News. I'm David Greene. And I'm Renee Montagne. 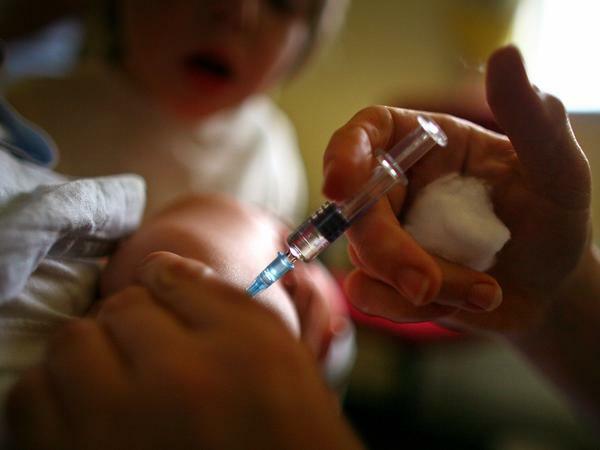 The link between vaccines and autism is something surveys show about a third of all parents are worried about. Even though numerous studies have found no such link, parents continue to be concerned and particularly, about the timing of vaccines. NPR's Jon Hamilton reports on a new government study that considers these worries. DR. FRANK DESTEFANO: Too many vaccines either in one day, or early in life, can be too much for - you know, a young infant or child's immune system to handle. HAMIILTON: Leading to problems like autism, so DeStefano and a team of researchers decided to test the idea. They compared the vaccine histories of about 250 kids who had autism spectrum disorder, with those of about 750 typical kids. Specifically, the researchers looked at what scientists call antigens. An antigen is a substance in a vaccine that causes the body to produce antibodies, the cells that help fight off infections. The researchers wanted to know how many antigens each child received, and whether that affected the risk of autism. DeStefano says the results, published in The Journal of Pediatrics, were unequivocal. DESTEFANO: The amount of antigens from vaccines received on one day of vaccination, or in total during the first two years of life, is not related to the development of autism spectrum disorder in children. HAMIILTON: DeStefano says that makes sense because kids are exposed to antigens all the time, in the form of bacteria and viruses. DESTEFANO: It's not really clear why a few more antigens from vaccines would be something that the immune system could not handle. HAMIILTON: And DeStefano says the study found something else that may reassure parents worried by the number of shots an infant gets in the first couple of years of life. DESTEFANO: Although the number of vaccines has gone up, the actual number of antigens in vaccines has gone down markedly. HAMIILTON: In the late 1990s, the vaccination schedule exposed children to several thousand antigens. By 2012, that number had fallen to 315. DeStefano says the dramatic reduction is because vaccines have become much more precise in the way they stimulate the immune system. Ellen Wright Clayton, of Vanderbilt University, says the new study addresses a surprisingly widespread perception. ELLEN WRIGHT CLAYTON: I certainly hope that a carefully conducted study like this will get a lot of play, and that some people will find this convincing. HAMIILTON: Clayton says that would let researchers pursue more important questions. CLAYTON: The sad part is by focusing on the question of whether vaccines cause autism spectrum disorders, they're missing the opportunity to look at what the real causes are. It's not vaccines. HAMIILTON: The new study probably won't convince everybody. But Autism Speaks, a major advocacy and research group, seems ready to move beyond the vaccine issue. Geri Dawson is the group's top scientist. GERI DAWSON: We still don't understand, fully, the causes of autism. And we know that genetic factors play a role, but we also believe that environmental factors play a role. HAMIILTON: Dawson says those environmental factors include things that can affect a baby in the womb. DAWSON: What nutrition the mother received during pregnancy; what kind of medications did she receive; did the mother have an infection during pregnancy? HAMIILTON: Dawson says researchers also need to answer questions about environmental factors that could affect a baby soon after birth; things like exposure to pesticides or pollution. She says when scientists have more answers about what does cause autism, parents will be less likely to focus on things that probably don't, like vaccines. Jon Hamilton, NPR News. Transcript provided by NPR, Copyright NPR.